Qu, C.F., Liu, F.M., Zheng, Z., Wang, Y.B., Li, X.G., Yuan, H.M., Li, N., An, M.L., Wang, X.X., He, Y.Y., Li, L.L. and Miao, J.L. 2017. Effects of ocean acidification on the physiological performance and carbon production of the Antarctic sea ice diatom Nitzschia sp. ICE-H. Marine Pollution Bulletin 120: 184-191. Citing Somero (2012), Qu et al. (2017) say that Southern Ocean ecosystems “are canaries in the coal mine for global changes” in that they “are particularly susceptible to ocean acidification.” This hypothesized outcome stems from model predictions that rising atmospheric CO2 will reduce the aragonite saturation state of seawater, resulting in an undersaturation, which is, in turn, expected to cause all sorts of problems for calcifying marine organisms living in such waters, potentially leading to the mass extinction of marine organisms and a disruption of the global carbon cycle. As their contribution to this important topic, the twelve-member research team of Qu et al. set out to examine the impacts of ocean acidification on a key sea ice diatom of the Southern Ocean, Nitzschia sp. ICE-H. More specifically, they investigated its physiological response, nutrient uptake and carbon fixation in response to two levels of atmospheric CO2: current (400 ppm; seawater pH of 8.061) and high (1000 ppm; seawater pH of 7.514). And what did their experiment reveal? Diatom exposure to elevated CO2 (i.e., ocean acidification) impacted multiple metabolic processes, including growth, photosynthesis, carbon fixation and inorganic nutrient uptake. The mean cell concentration, for example, was enhanced by 11% (Figure 1a). Mean growth rates improved by 13.7% (Figure 1b) and chl a contents rose by 5-20% (Figure 1c). Additionally, nitrogen and phosphorus uptake rates both increased by 25% and particulate organic carbon (POC) production rose by 23% (Figure 1d). What is more, the CO2-induced enhancement in POC production reduced the CO2 (increased the pH) of the surrounding seawater medium and enhanced carbon sequestration. Figure 1. 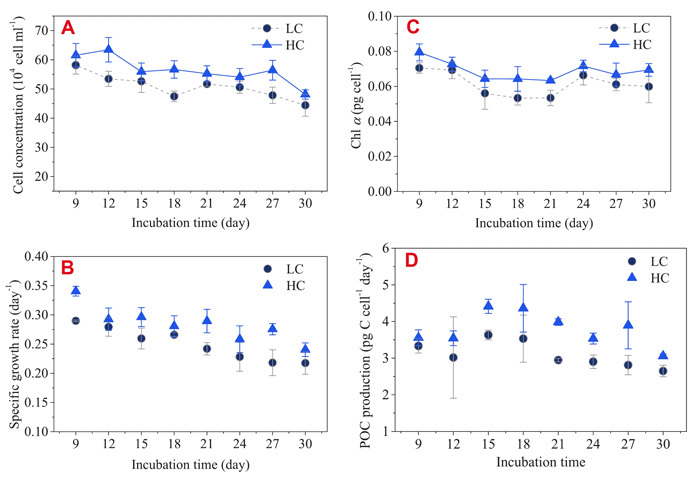 Cell concentration (panel A), specific growth rate (panel B), Chl a content (panel C) and particulate organic carbon (POC) production (panel D) of Nitzschia sp. ICE-H under low (~400 ppm; LC) and high (1000 ppm; HC) CO2levels. Adapted from Qu et al. (2017). Somero, G.N. 2012. The physiology of global change: linking patterns to mechanisms. Annual Review of Marine Science 4: 39-61.